Jesus is not merely the start and standard for salvation, but…the beginning, middle, and end of my salvation. The gospel is necessary for getting right & doing right w/God, for salvation & sanctification. Disciple is an identity; everything else is a role. The gospel makes all-encompassing demands, and what the gospel demands, it supplies. Jesus, alone, should take the center place in our lives, not our Bible Reading, evangelism, character, or effort to be different or spiritual. … the gospel that makes disciples is the very same gospel that matures disciples. The gospel frees us from running ragged trying to please God with holiness and social justice, because Jesus has pleased God for us & secured the mission. … our approval before God rests, not on our performance but on the performance of Jesus. God’s forgiveness frees us from judgement, not from obedience. Repentance is not a one time act to get us into heaven, but an entire way of life to maintain Christian joy. Jesus didn’t die & rise to rapture individual disciples, but to make a community that reflects his glory through dependence on one another. The challenge of loving others as we love ourselves confronts our deep-down idolatries. It exposes our functional worship of individual privacy, convenience, & comfort. 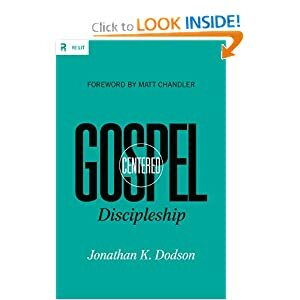 Follow the Gospel Centered Disicpleship blog as well for great thinking on discipleship and life in Christ. Posted on September 14, 2012, in Books worth reading, Discipleship. Bookmark the permalink. Leave a comment.